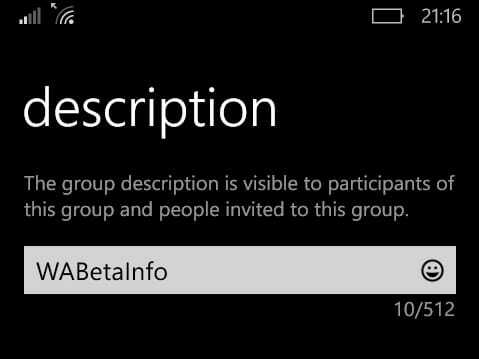 We have published an article for Android about the Group Description feature, remotely enabled in WhatsApp beta for Android 2.18.54 update, and exactly 10 minutes ago, WhatsApp has enabled the same feature for Windows Phone too! You can find a new row called “Description” in all your groups. All participants can now view and modify the group description without limitation. 512 character allowed for the group description. When a new participant joins the group using a group invite link (or an admin adds him), the new participant will see a pinned box, where it will be visible the description of the group. The pinned description will automatically disappear once the user leaves the chat and it won’t appear again. As above mentioned, all participants can edit the group description, but the administrator will be able to restrict this feature, preventing no-administrators to modify the group description. Note that this privacy option will available in future. You need to update your WhatsApp version to the 2.18.28 Windows Phone beta update on the Store, in order to remotely receive the activation of this feature. The feature will be enabled for iOS as well very soon. 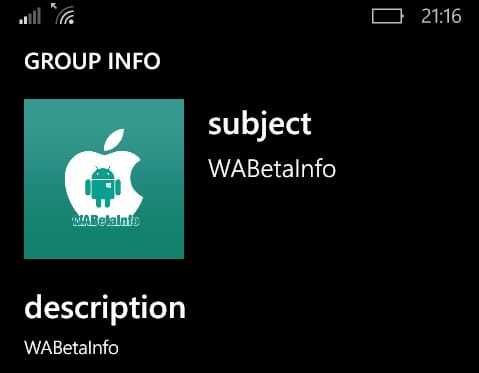 Previous PostPrevious WhatsApp is rolling out the group description feature for all Android users!